The British Newspaper Archive (BNA) regularly releases new titles available (for paying subscribers) to search. I use digitised newspapers regularly in my research, so when in February the BNA announced a raft of new suffragette papers had been added to the collection I was intrigued to see whether these might shed light on the activities of some of the women I've been researching. My curiosity was rewarded recently when I discovered evidence that archaeological-artist (and later author) Jessie Mothersole, about whom I have previously written, participated in the Women's Social and Political Union (WSPU) "Christmas Fair and Fete" in 1911. I knew Jessie was active in the suffrage movement – in his 1914 memoir her art-tutor Henry Holiday included a suffrage-infused poem she wrote with his illustration on suffrage originally published in Labour Leader, and a copy of her portrait of suffragette Myra Sadd Brown is in the Women's Library at LSE. However, notices in WSPU newspaper Votes for Women, issues of which are now digitised and searchable on the BNA database, reveal that Jessie Mothersole was one of a number of artists involved in creating artwork for the Fair which took place over six days in early December 1911 at Portman Rooms on Baker Street. Various branches of the WSPU were responsible for organising tables and activities at the Fair, representing London neighbourhoods and other cities and regions, including Leeds, Birmingham, Hertfordshire, Nottingham and Kent. Profits were to go towards the WSPU. It seems that Jessie created the signage for the Hampstead WSPU branch's stand (selling chintz and ceramics), which was organised by branch Secretary Lilian Martha Hicks of Finchley Road. Jessie was thanked by name for her efforts alongside other fellow artists in a letter from Sylvia Pankhurst to the Editor of Votes for Women published in the paper on the penultimate day of the Fair. The Women's Library has a series of postcards showing scenes of the 1911 Fair; they are accessible in the Jill Craigie Collection (Ref 7JCC/O/01) at the LSE Library. Thanks very much to Debbie Challis for bringing these to my attention! Debbie has also written about documents relating to archaeologist Hilda Urlin Petrie's suffrage activities; you can read Part 1 and Part 2 of her Hilda history on the Institute of Archaeology History of Archaeology Network website. In related news Fern Riddell's biography of suffragette Kitty Marion, Death in Ten Minutes, has been published this month by Hodder & Stoughton, and the LSE Library's exhibition "At Last! Votes for Women" will be open from next week (23 April) until the end of August. Suffrage historian Elizabeth Crawford has just published Art and Suffrage, a compendium of biographies of artists working for the suffrage movement. Jessie Mothersole isn't included in it, but I'm sure some of the other artists who took part in the Fair are. Her presence at the WSPU Christmas Fair suggests that she supported a more militant approach to suffrage than other women working in archaeology (like Agnes Conway, for example). Just how far that support went, however, remains a mystery. For now. Crawford, E. 2018. Art and Suffrage: a biographical dictionary of suffrage artists. London: Francis Boutle. Crawford, E. 1999. The Women's Suffrage Movement: A Reference Guide. London: Routledge. Christmas Fair and Fete. Votes for Women. 18 August 1911: 749. Pankhurst, E. S. Letter to the Editor. Votes for Women. 8 Dec 1911: 163. The Imperial War Museum (IWM) turned 100 last year, and with the 100th anniversary of the end of the First World War coming later this year, and the 100th anniversary of the first tranche of women getting the right to vote in the UK, 2018 has had a celebratory start. As part of the general celebratory mood, the IWM has instigated a project, WomensWork100, which simultaneously references the suffrage anniversary, WW1, and the Museum's own history all in one. Alongside highlighting the role of women during the war, WomensWork100 also covers the role of the Women's Work Committee in forming the Museum's collection of objects representing women at war from 1917 onward. One of the members of that Committee was Agnes Conway; at the IWM Centenary Partnership's request I wrote a short article on Agnes's life, with a focus on her interest in suffrage and her work during the war. You can read "Agnes Conway: Her Life and Legacy" on the Imperial War Museum's Centenary Project website. The Monument peeking through the trees, from a position approximate to the location of Agnes's flat. Photo: A. Thornton, 2016. Archives are full of references to locations that don’t exist anymore – landscapes and cityscapes change constantly as roads and railways are put down, old buildings are demolished and new ones put in their place. Unsurprisingly Rome is no different to any other place in that respect. I went to Rome for the first time this summer. Although the trip was meant to be a holiday, it’s hard to abandon research interests entirely – even when supposedly ‘taking a break’. Rome was an important stop for 19th and early 20th century British tourists to the Continent, as it is today. I wanted to find the Rome that archaeologist ﻿Agnes Conway﻿ would have known: the Rome of 1912. Early that year she travelled to Rome to live for a few months as a student at the British School. At that time the archaeologists Thomas Ashby (Director) and Eugenie Sellers Strong (Assistant Director) were running operations. This was a moment of transition in the School’s history. Founded in 1901, for the first decade of its existence it had occupied space in the Palazzo Odescalchi, a 17th century building between the Via del Corso and the Piazza S. S. Apostoli in the heart of Rome. Agnes and a friend rented a flat that overlooked the then newly-finished Monument to Victor Emmanuel II. The flat’s location on the Via delle Pedecchia was significant too; the area was undergoing major transformation (read demolition) as a result of the Monument’s construction. Via delle Pedecchia no longer exists, but as far as I can work out it was a stone’s throw away from the Capitoline Museums that were critical to Agnes’s interests, and five minutes walk away from the British School. When they weren’t working, Agnes and her friend spent a considerable amount of time discovering Rome’s many restaurants. Though some of the museums Agnes visited are still there, others, like the Kircherian, have disappeared. The British School moved in 1916 to an Edwin Lutyens building in the Valle Giulia; its facade had been the entrance to the British Pavilion for the 1911 International Art Exhibition. I did manage to find an exhibition at the Museo di Roma of satirical cartoons and sketches of the festivals of Rome that illuminated the city’s 19th-century history brilliantly. There were even some cartoons of archaeologists – a bonus. On a slightly more seasonal note, the 19th-century traveller and author Amelia Edwards also spent time in Rome. She first arrived there in the 1850s; her biographer Brenda Moon describes Edwards' fascination with the city. On her return from the Continent, Edwards solidified her reputation as a writer of short stories and novels, with gothic tales of murder and hauntings a frequent product of her pen. These have been collected at various times and republished. In Night on the Borders of the Black Forest, for example, is a tale of murder set in Rome, “The Tragedy in the Palazzo Bardallo”. Its value, beyond the pull of the storyline (death and insanity), is Edwards’ vivid portrait of a Victorian British resident’s experience of the city. Thornton, A. 2011. 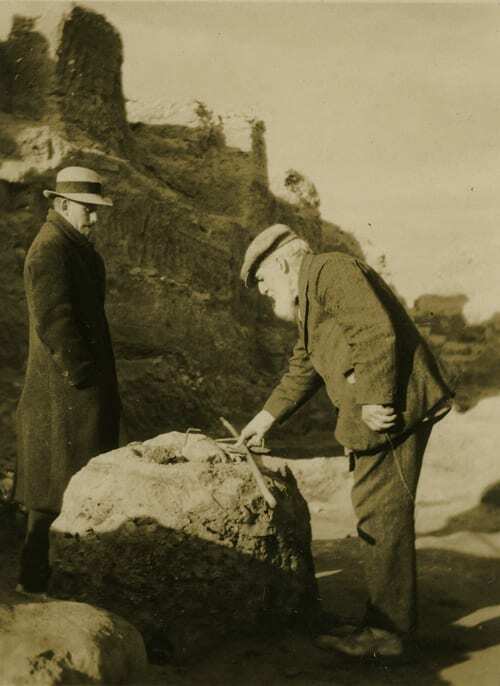 The Allure of Archaeology: Agnes Conway and Jane Harrison at Newnham College, 1903–1907. Bulletin of the History of Archaeology, 21 (1): 37–56. Wallace-Hadrill, A. 2001. The British School at Rome: One Hundred Years. Rome: British School at Rome. Dalby, R. 2008. Introduction. In A. B. Edwards All Saint's Eve. (Tales of Mystery and the Supernatural). Wordsworth Editions Ltd.
Is ‘club-land’ dead? Far from it. At the end of April, Amelia Gentleman’s Guardian article on London’s Garrick Club revealed an ongoing battle of the sexes to open the city's few still all-male gentlemen’s clubs to women. The Garrick is one them. Detail of the spine of a volume of the Whitbread Library series devoted to introducing the variety of clubs in Britain. The Victorian caricaturist Henry Maximillan Beerbohm’s illustrations of “Club Types” (1892) reveal the variety of clubs and members in London’s club-land. If you’re interested, as I am, in the social networks of the past it’s pretty vital to get to grips with the phenomenon of ‘the club’. Archaeologists-past were members of the Athenaeum and Savile Clubs, as well as what I can only describe as sub-clubs coming out of membership. In his splendidly gossipy memoir Reminiscences the Assyriologist Archibald Henry Sayce records his initiation into a dining club of Athenaeum members particularly interested in the Orient. In Beerbohm’s drawings Savile and Athenaeum “types” are right next to each other. The Albemarle was the oldest, established by the artist Henry Holiday among others. Holiday’s Reminiscences (a popular title!) of My Life like Sayce’s chronicle the fabric of social life among artistic, literary and political circles. Despite nay-sayers who were sure that only “shocking things” would result from men and women sharing club premises and membership, the Albemarle opened in 1874. ** Fittingly, Beerbohm’s illustration of an Albemarle “type” is a spare line drawing of a female figure in skirt and puffed-sleeve jacket carrying a parasol. Amongst the Albemarle’s membership in the 1890s were the writer and aesthete Oscar Wilde and his wife Constance Lloyd Wilde, a feminist and champion of rational dress. The club house at 13 Albemarle Street was the place where the Marquess of Queensbury left his infamous note for Wilde in early 1895. A handy list of the Albemarle Club’s membership in the 1930s includes a few archaeologists: Winifred Lamb and George and Agnes Horsfield. George Horsfield’s opinion of London club-types was not high, but he felt that the Albemarle at least offered he and Agnes a place to stay in London while they had no house in town. Perusing the list of 1930s Albemarle members reveals a number of married couples. One such couple was celebrated anthropologist and Golden Bough author James George Frazer and his wife, Lilly, also an author (notably, of a sort of abridged Golden Bough for young people, and an early history of dancing). The Sesame Club was one street west of the Albemarle on Dover Street - dubbed “the centre of feminine Club-land”. Established in 1895, the Sesame was known for its lectures, attracting members particularly interested in education. It was the classicist Jane Harrison’s London base. Lists of members, programmes of events, rules and regulations and descriptions of facilities take you to the door of the club but not far beyond. For the 21st century researcher like me club life as it relates to the archaeologists I investigate is shrouded in tantalising mystery. Club names most frequently appear in addresses or signatures on letters; these remaining traces merely serve to whet the appetite. Further revelations await as my research continues. Correspondence published in the first biography of Harrison (written by her student Jessie Crum Stewart), gives us a peek into ‘mixed’ club life. This glimpse comes, intriguingly, in the form of a mock scene set in one such “modern advanced club”. Sprinkled amongst the “divans, draperies, cigarettes and ashtrays” the club’s members include “New Women” and “decayed, docile husbands”. The scene was the work of classicist Arthur Woollgar Verrall (both he and his wife Margaret Merrifield Verrall were lecturers at Cambridge). Despite his reference to decayed husbands Verrall’s caricature points to the 'mixed' club as a space where men and women could meet on relatively equal terms. In fact, the Albemarle Club’s rules dictated that its governing committee had to be made up of male and female members in equal measure. So the ‘mixed’ club is definitely something to celebrate, especially when equality between the sexes is still a issue of relevance today. Albemarle Club. 1932. Rules and Regulations and List of Members of the Albemarle Club. London. Ackerman, R. 2004. Frazer, Lilly, Lady Frazer [née Elisabeth Johanna de Boys Adelsdorfer] (1854/5-1941). Oxford Dictionary of National Biography. Oxford: Oxford University Press. Crawford, E. The Women’s Suffrage Movement: A Reference Guide 1868-1928. London: Routledge. Doughan, D. and Gordon, P. 2006. Women, Clubs and Associations in Britain. Abingdon, Oxon: Routledge. Lowe, N. 2005. The Problematic Verrall: The Skeptic at Law. In C. Stray (Ed.) The Owl of Minerva: The Cambridge Praelections of 1906. Proceedings of the Cambridge Philological Society Supplementary Volume 28: 142-160. Moyle, F. 2011. Constance: the Tragic and Scandalous Life of Mrs. Oscar Wilde. London: John Murray. Sayce, A. H. 1923. Reminiscences. London: Macmillan & Co. Ltd.
Stewart, J. 1959. Jane Ellen Harrison: A Portrait from Letters. London: The Merlin Press. *A number of other London clubs open to men and women can be found in Crawford’s book. **It is perhaps unsurprising that Holiday was a vigorous supporter of women’s suffrage. Holiday also had a strong interest in archaeology; he was a member of the Hellenic Society and claimed in his memoir to have introduced a young Hilda Urlin, whom he had used as a model for the face of the serving girl in his 1888 painting Aspasia on the Pynx, to Flinders Petrie. The Slade School trained artist Jessie Mothersole, who worked as a copyist on site at Saqqara in 1903, was a long-standing pupil of Holiday’s.